« Dating Your Husband: Homecoming Game! I happen to love Thai peanut sauce, especially on a barbeque spring roll. 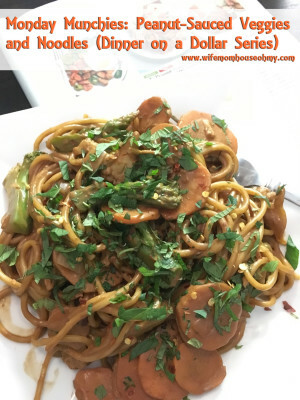 So when I saw this peanut-sauced veggies and noodles, I jumped all over it. I pretty much followed the recipe to the letter…and there are definitely some things I would change. Typically, I can say that the recipes I’ve tried out of the Better Homes and Gardens Dinner on a Dollar have been awesome with respect to the taste, definitely the budget and ease. However, this one needs a few tweaks in my book. First, too much peanut butter can lead to a sticky situation. In the original recipe, the peanut butter outnumbered the other ingredients. Unfortunately, the peanut butter left the pasta paste covered and a little sweet (the sugar added to the peanut butter was a little overpowering for me). The second change I’d recommend is thinning the sauce. Not only will adding extra coconut milk thin it out the sauce but will also dilute the peanut butter. Third, I’m a fan of linguine (hands down, add some chicken masala or clams in a wine sauce, just yum). But Italian pastas add to the stickiness. A good old fashion rice noodle gives the same sensation of linguine but keeps the sauce from sticking. I love the idea presented in the magazine but here is how I would tweak it for some yummy goodness and decadent flavor while sticking to a dinner on a dollar budget! 1. Start by cooking the rice noodles according to the package’s instructions. 2. About 3 minutes before the noodles are done cooking, add the frozen vegetables to the noodles to cook. Drain the pot. Rinse the veggies and the noodles off and put them back into the pot. 3. While the pasta is cooking, mix together the peanut butter, the coconut milk, soy sauce, ginger, lime juice, and garlic (optional) in a large bowl. Whisk until well combined. If thick, add more coconut milk. 4. Pour the peanut butter liquid mixture over the pasta and tossing it until the pasta and vegetables are coated. 5. Heat the entire pasta meal over a medium heat. 6. Sprinkle the crushed red pepper over the pasta meal and mix together. 7. Serve and garnish with the fresh minced mint. Making these few changes will shift the flavor from overpoweringly peanut butter flavored and texture to a more Thai peanut sauce flavor. These changes don’t really alter the budget but it sure does alter the flavor palette. I’d love to hear if you give this tweaked recipe a try and hear what you think about it. I will say this, Thai peanut sauce is a fairly acquired taste. Its not for everyone.